From the Rarities Committee's files - Identification of Caspian Gull. Part 2: phenotypic variability and the field characteristics of hybrids, by Chris Gibbins, Grzegorz Neubauer and Brian Small, IN: BB 104/2011. Fig. 7. 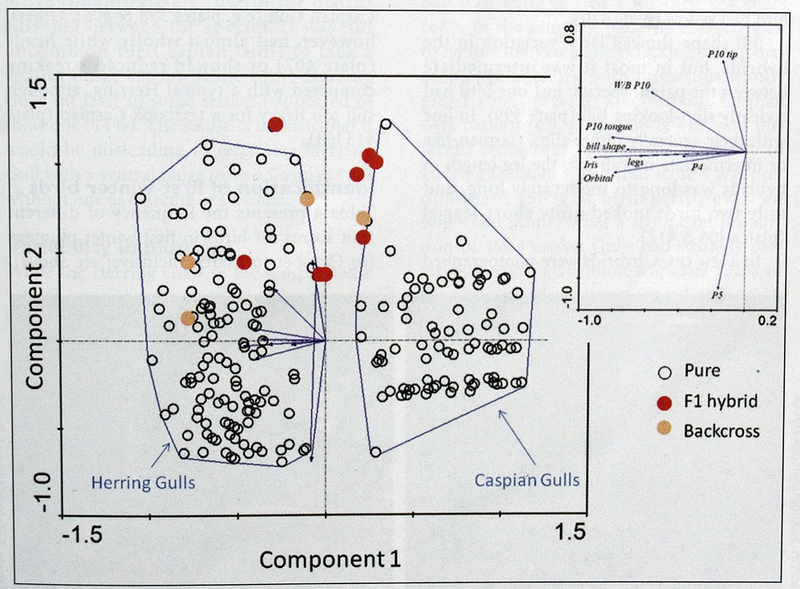 PCA biplot showing sample adult Herring Larus argentatus and Caspian Gulls L cachinnans and a number of proven hybrids. Each circle represents a sample bird. Together, axes 1 and 2 explain 62.3% of the overall variance in the measured traits of the sample birds. Polygons group pure individuals of the two species, while hybrids are shown as coloured symbols. Trait arrows are shown on the main part of the figure (radiating from the origin); to avoid clutter; the inset shows the labels for these. Adult Herring and Caspian Gulls showed complete separation across the PCA biplot, with no overlap in the polygons which delimit the two species. This separation was across component (axis) 1, with Herring Gulls located to the left and Caspian Gulls to the right. Arrows for several of the measured traits (notably P10 tongue colour, iris peppering and bill shape) sit more or less parallel to axis 1, indicating that they are primarily responsible for the separation of the species in this horizontal (left-to-right) dimension. The arrow for P5 is long, indicating that this feature differs markedly among sample birds. The P5 arrow sits very close to component (axis) 2. This indicates that the separation of sample birds in the vertical dimension is related primarily to variability in their P5 pattern. 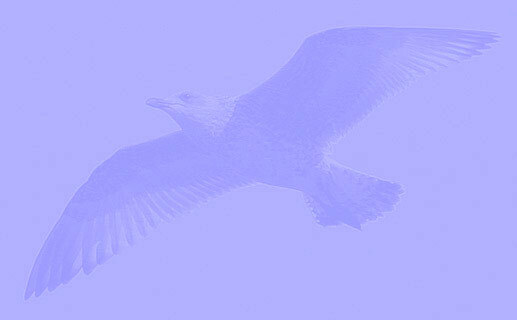 However, the fact that the two species do not separate in this dimension (i.e. there is no overall difference in the positions that the species occupy across axis 2) indicates that the extent of black on P5 does not differ systematically between them; consequently, this feature is not important for field identification. The arrow for the pattern on the P10 tip is also long and lies close to component 2, so again we conclude that while it differs between sample birds, it is not important in the separation of the two species.